I love working with inks. Whether I am sketching outside or creating larger pieces in the studio, ink is one of my favorite materials. Like many of you, early on I began working with India ink. It’s rich deep darks provided a boldness that was, and still is, alluring. I know, sometimes it was a little scary too! Over the years I’ve tried lots of other types of ink and grown fond of quite a few. So, I thought that I’d explore the attributes of some inks that have I used, share a bit of basic info about them, and see what you like about them as well. Below you can see a page of ink tests that I made today. With each of the inks, I have kept my testing pretty basic, using four simple steps. In order to see how each the inks look and behaves on a dry paper surface surface, I applied a large brush-mark of each ink to the paper. Then I added a few parallel lines using a small brush. Because I also want to know how the inks interact with water, I conducted two additional tests; first I heavily wet a small area of paper and dropped a tiny bit of full strength ink into that wet paper surface. And, because I’m interested in the re-wetting of the inks, after those short parallel lines were completely dry, I brushed a liberal amount of water over parts of the lines to test test the ability of each ink to resist the effects of water. Above is a strip of inks that I have tested in this manner. Now let’s get a bit closer look at the results. To the left you can see a close look at three of the first inks I tested in this way. The Winsor Newton and Higgins (#4415) are both traditional India inks. When dry the large areas of ink where pretty even and flat (the Higgins a slightly less flat, a tiny bit less dense) and were only barely transparent. Both also had that “metallic carbon in shellac sheen” we associate with India ink. The Higgins (#44041) Eternal Ink was very different; in fact it may be a renamed versions of a Higgins ink I remember from my college days. You can see that it is bit less dense than the first two and in the re-wetting test, it obviously isn’t water resistant … much less waterproof. This ink displayed something I used to associate with all black Higgins inks; it is definitely made with a non-black pigment. When younger, I was always aghast (and secretly a little intrigued) that Higgins would often break down into a violet and a yellow brown or olive green) when exposed to water. Here, in both of the water tests, we can see some of the warm and violet casts of the ink. On the plus side, it being labeled “Eternal” should mean it is archival (Ph neutral and fade resistant in light). So it is a good ink; just do be aware though of the visual surprises it may provide you when in comes in contact with water! Another black ink I use a good bit now is the Yasutomo Sumi Ink. Sumi inks are derived from the same Chinese ink traditions that gave us India inks. I enjoy the velvety look of this one a lot; it is a rich, intense ink black ink. There is much less of a “shellac” shine to this ink and it makes a luscious grey wash too. Everything I read on the bottle, in commercial descriptions, and on the product website says that Yasutomo Sumi is permanent. But, as you can see, re-wetting it produced a beautiful dark grey wash! I re-did my experiment and waited six hours to allow the inks to cure more. It still re-wet producing a wash. Now, when reading about inks, you will often hear the term “bullet-proof” in reference to an ink that bind permanently to the cellulose fibers of paper. So, “bullet proof inks are waterproof when allowed to dry in contact with the cellulose fibers of the paper. Perhaps the Canson watercolor paper’s sizing kept the ink from coming chemically into contact with the cellulose … or maybe my ink application was so dense that the upper layers of ink where unable to reach the paper fibers? So, I have to wonder if claims for this inks permanence were negated by the way I was conducting my test with a sized paper. Maybe on an unsized Sumi paper, this ink is permanent as soon as it is dry? I will have to explore that more at a later date! 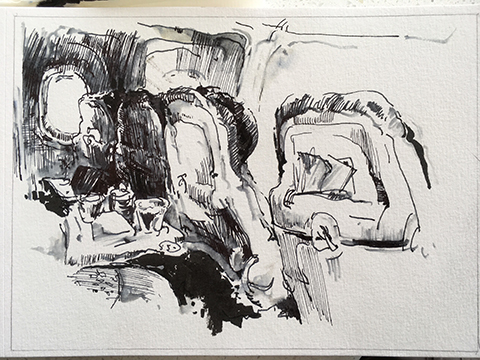 The next ink I tested, Pen & Ink Sketch, is also an India ink but of a quite different kind. It is made by Art Alternatives out of the UK. They make this black India ink and sell it bottled and in the smaller international size fountain pen cartridges. As soon as you know that it is for fountain pens, it is obvious why it is different from standard India ink. It has to be. Inks with shellac can dry and stubbornly clog the tiny ink channel inside a fountain pen and/or the nib very quickly. It isn’t a nice way for a fountain pen to die. This ink is lovely though. A soft satin black, not made shiny by any shellac or super sticky gum/sap based binders, it flows beautifully into water. As you see to the left, it re-wets a tiny bit too. Most of the black ink stayed in the paper’s fibers or on the paper surface; only a small amount became active when I added water and gently rubbed the surface of the ink marks. This could make it an excellent candidate for sketching when you need or want to spread only a tiny bit of light washes from previously applied pen or brush drawn lines. My next three inks are Holbien Special Black, Liquitex Professional Carbon Black, and Royal Talens Amsterdam Oxide Black. All are dense rich blacks. They all handle well in the brush and the pen. While they seem to react slightly differently when dropped into water or onto wet paper … the Holbien seemed to break down a bit and both the Liquitex and the Royal Talens ran pretty freely … they were equally permanent when I tried the re-wet test. This shouldn’t surprise us though. Each of them is in fact an acrylic polymer emulsion based ink. Of the three the Hobien seemed the most opaque to me. The other two came close when seen as a mass of color, less so when in thinner applications. The fact that all three are not re-wettable means they are great for using under additional wet mediums. The Talens and Liquitex seemed to flow well but I must admit am a little leery about using the Holbien to create washes. These last four inks are really fun. Those first two are specifically made for use with fountain pens. Manuscript Black and Noodler’s Lexington Gray. The last two were both made locally. Fleagall, in the brown bottle with the dropper cap, is made by an artist/graphic designer who teaches at a local community college. The other ink, the Iron Gall is made by a local artisan/craftsman who makes a lot of his own artist’s materials . As the names imply, Manuscript Black is a bit darker and more densely pigmented than the Lexington Gray. The Manuscript ink spread easily and pretty evenly in the water drop at the top of the test where as the Noodler’s reacted a bit oddly in water. Despite being lighter, in the re-wetting process the Lexington Gray appears to be more permanent than the Manuscript Black. The last two inks are both iron gall inks. Iron gall inks were the primary inks used in European countries since about the 4th century and were only supplanted by other forms of ink in the 20th century. One of the reasons they were so popular is because they are easy to make and darken with age. Another advantage they have is that once they are thoroughly dry, they do not re-activate with water and hard to scrub off a surface. Notice both the Flea Gall and the Iron Gall inks are slightly violet when they are diluted. That is a characteristic that I like a lot. The slight transparency of both when applied even at moderate applications make both excellent candidates for ink wash drawings and paintings. There are two issues that limit the use of iron gall inks in the modern age. One is the tendency for them to be acidic. If not made properly they may be too acidic and can slowly “eat” through the paper. The second problem is they don’t play nicely with closed system mechanical pens. The iron-gallic particles that make up the ink’s pigment can slowly accumulate in a pen’s ink feed and clog it with a hard to clean mass of hardened ink. This isn’t a problem in a brush or a dip pen which are easier to clean. As you can see … I can be more than a bit nerdy about art supplies butI do hope this hasn’t been pedantic or preachy. I would love to hear what inks you like to work with too. Also, tell me if there any inks you think that I ought to try out …. for sketching or for using in the studio? And if you disagree about the qualities of a specific ink that I have talked about here, that is cool too; please do let me know. I am always open to re-evaluating materials … and to changing my ideas, my opinions! Now, it is time to get back out there and do dome sketching! There is a 30%-50% chance I will use some ink. Wish me luck. PS Coming soon, A review of other colors of ink. …. and some ink pens & brush pens too! 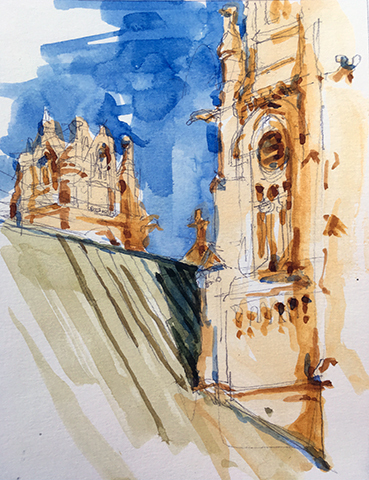 Wishing for Warm Weather Sketching? Today was one of the last days of the 2018-19 winter. So in tonight’s Intro to Watercolor Sketching class, did I celebrate the passing of Winter … or embrace the arrival of Spring? No, I pulled out a photo of late summer and proceeded to create a demonstration piece. Now before my sketching colleagues tar and feather me, let me assure everyone that we have been working for the past few weeks from real objects, objects that were right there in front of us. This evening, I needed to prep them for a bit of landscape-based sketching homework. So, by having them do a landscape from a photograph in class, I avoided them going out into the breezy, cold, and dark outdoors tonight. Each of the student picked a rural or urban landscape image photographed during the winter or spring. (I have a trove of old images that I have made over the years while I was out sketching or painting.) But me, not really thinking, I just grabbed a photograph and started my demonstration. With my photo, I showed them several alternative ways that I might consider cropping it. Next, I demo-ed how they could avoid doing a detailed drawing and instead just lay in a few quick lines to get a sense of where the major shapes would be placed. We then created very quick images with large blocks of colors. Besides my demo, I shared a blog post by Mari French Early Autumn Sketching At Thornham Roadbeds and links to several more of her posts that I thought would inspire their efforts ( Burnham Overy Marsh , Reed Beds and Tidal Mud ). 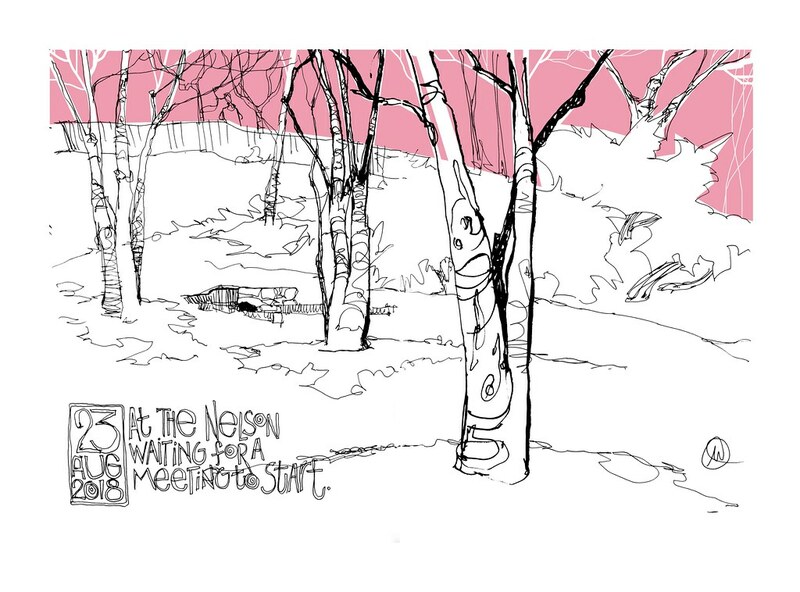 I really like her work and find her approach to sketching to be just wonderful. After that I let the students develop their images with as little or as much detail … and in any direction as they wished. As I moved through the class, coaching, encouraging, and occasionally stopping to do mini demos beside the students, I returned every once in a while to my demo piece and took a few minutes to continue developing this watercolor sketch too. This is the way it appeared as the class session concluded; all of preliminary pencil lines still intact. Here it is. A bit out of place. Late summer’s golden light on mature foliage and a sky thick with milky humidity. Maybe it is wishful thinking? Sometimes you just want it to be as simple as B&W. That was what I had in mind when I stopped along a rural highway on the way home and began sketching. It was a raw day … cold, wet, and grey as I pulled behind the local convenience store onto the side road. It wasn’t a grand or striking landscape, certainly not a pretty one. I was intrigued though by the scruffy roadside melange of signs, utility poles, foliage and winter weeds. I was confronting a normal image; I wanted to embrace the complexity yet distill it somehow and finding something interesting. Perhaps beauty. Grey and scruffy; yeah ink seemed to be the perfect choice. First starting with a pencil layout (above), I was soon using both a Waterman fountain pen and a Pentel brush-pen; working the major shape contours along with some areas of value/texture. Soon, to take advantage that I have this fountain pen loaded with a water-based and soluble ink, I had a water brush in hand and was manipulating, modifying the marks into small grey washes. The Pentel brush pen’s ink is pretty water resistant when it dries but, while is was still freshly applied, it too was soluble. Taking advantage of that … I dragged softer greys almost anywhere I wanted in the composition. 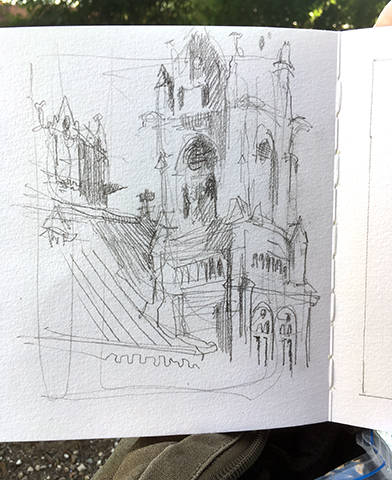 I liked the sketch as it is above but I didn’t get the sense of overcast light. It felt as if I had turned on some bright light and cleared away the gloom, robbing the place of its subdued, even, wet light. My grey day wasn’t here yet. So I continued on, adding a more blacks marks, dry brush, and washes. I even decided to include a bit of dry and wet color (using Caran d’Ache watercolor leads and wet Daniel Smith watercolors) to the image. It was beginning to feel a lot more like like the dark day and sodden day that it was. As I applied the bits of color, I was trying to integrate them into the greys and darks. I wasn’t being quite as simple as B&W and while I was ok with that … the color was becoming a little too strident, too prominent. As with the earlier, “lighter” version, I actually enjoyed the piece quite a bit at this point but I really felt I had deviated too much from the grey of the day. So, with the aid of water, a touch or two of gouache, and of course … more ink, I reasserted the dark grey-ness by softening, muting, replacing, and overpainting some areas of color. No, I don’t think this piece is pretty. It wasn’t a pretty day. The damp air was bitting cold, the ground was a slippery, oozing, wet mess … and the sky was deep dark grey; it was gloriously miserable. I think the sketch pretty much got there. I love fall; I think it might just be the most visually intriguing time of year. The changes from late summer are subtle at first. And, if like this year, there is ample moisture and the chill doesn’t come on too abruptly, the shift is almost imperceptible. Well, this weekend ended all of that. The first hints of frostiness began to take over the local terrain as the temperatures dropped into the 20s/30s range.. The color balance has begun changing in earnest too. On Saturday, it was over cast. The clouds were stacking up on the west side of the Blue Ridge all morning. Those hoping for a sunny sky would have to wait ’til well past noon. That meant that at the lower Sherando Lake (in the George Washington National Forest) everything was sheathed in a grey light. Perfect for a little bit of sketching with ink! I had to work quickly though, so after a really quick and light gesture drawing with a mechanical pencil, I continued to create gesture lines with a Waterman Phileas pen. Not the most flexible of nibs but richly bold at times unless, as I often do, I turn and draw with the nib upside down. If I want a richer variety of line, I might pull out a Sailor Fude fountain pen; it gives me beautiful transitions between thick and thin lines and it can also produce rich broken ink lines if turned just right and pulled across the page quickly. But not this time. Instead I opted for my Pentel Brush Pen. Back and forth, alternating between the two, pen and brush pen, I worked up the 5×7 sketch. Next, I took out a water-brush. The Waterman is loaded with a water soluble ink; the Pentel’s ink is only re-wettable for a few minutes. I rapidly moved water around, re-activating, softening, and redistributing some of the fountain pen ink to create a few small ink washes. Even before the paper began to dry, I had out some watercolor and began to mix up a few subdued, even chromatic grey, tones, Soon I was adding these to the areas of pale grey ink. And as these and paper dried, I added a few more pen and brush marks to hint at the mass of the stones (in the stream and foot bridge) as well as the swift water racing down to the lake. But today, is a very different experience. I am on my way to drop off posters and to teach a watercolor class later this evening, I am enjoying the brightest and clearest of cool autumn days. Only the smallest wisps of cloud have slipped or skittered through the breezy and intense blue sky. I have been thinking about ditching the distribution of all those adverts for my next, late fall, class and spending the whole day painting … and maybe even doing some reference drawing and photographing too. But I figure that I should compromise with myself; still make my rounds but stop and make at least a sketch or two. The last sketch of the day, the one below, is still wet and I haven’t even gotten most of the unneeded pencil lines out of it yet! Like most of us, I wish that I could draw and paint most of the day, almost all of the time. It is autumn after all and the season’s visual possibilities are almost unlimited … even if my time is. We’ve had a very wet summer. And an astoundingly wet early fall too. That has made dodging or finding ways to work around all the rain a bit pretty much the norm the last few months. 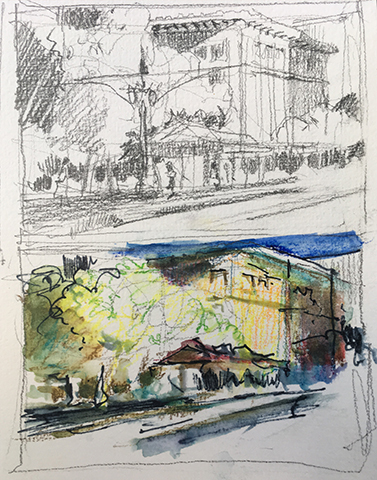 This last week and a half has been more of the same … whether I was working on my own or when I gathered some fellow sketchers to visually explore a 100 plus year old local landmark. In the piece below, while it had stopped raining for a bit … I wanted the lowest vantage point; sitting on ground However, our recent over abundance of “precip” has been further augmented by the previous hurricane which passing this way the afternoon and evening before …. so almost everywhere was a muddy mess. the remnants of our most recent tropical system (Hurricane Michael) as it slip up the east coast. 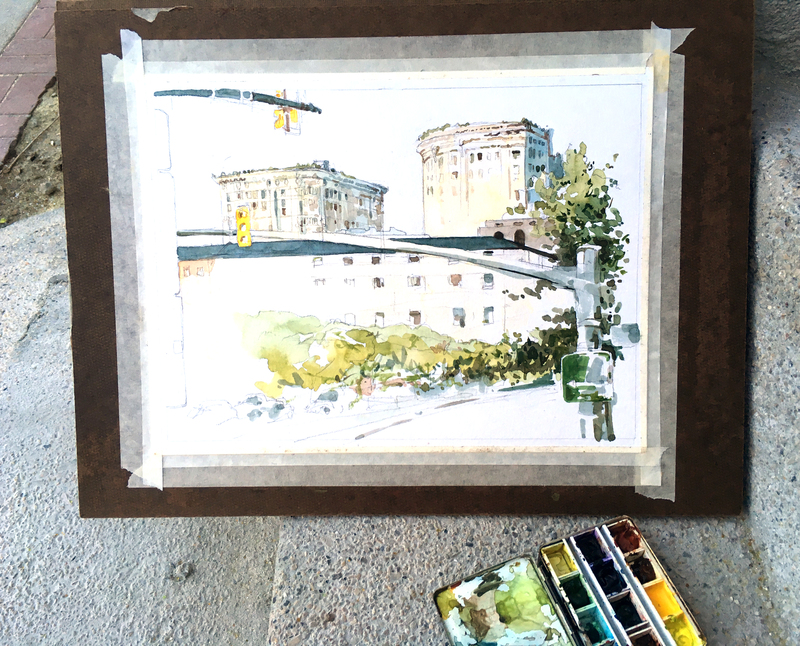 Eventually, I had to get wet anywayEarlier in the week, I met up with members of the Charlottesville chapter of Urban Sketchers to draw the old Silk Mill building. It is a grand old structure, built about 1895. I think the original part of the building and the 1940s addition was restored and much of it repurposed just a few years back. The complex now houses a number of professional offices, new tech companies, and even a large co-op clay studio/teaching/exhibition space. I started this piece thinking that I might just work it up with only ink … maybe partially in the spirit of October’s month long “Inktober” challenge (#inktober, #inktober2018). Despite my intention to use mostly a fountain pen, a brush pen, and perhaps a little ink wash, I soon found myself reaching for a bit of color. Autumn’s hues are such a lovely enticement; even when the changing leaves are, as they are here, mostly backlit. That was not a completely smart choice as the blue grey clouds where quickly thickening and darkening. I really did have to race to stay ahead of the impending rain. I made it with about 9-10 minutes to spare. Damp, but undeterred; I will be back at it again soon. Here is a blog by an artist in the Kansas City area. The image is nice and the ideas seem pretty solid too. Hope you enjoy it! 26 August, 2018. I had an early morning meeting in the city on Thursday, and misjudged the timing of my arrival so that I pulled up to the art museum way too early. 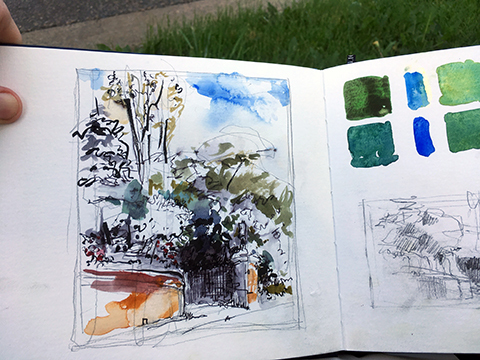 Taking up pen and sketchbook, both of which were on my backseat, I walked from the car and found myself under a stand of trees, settled in on a park bench and I began to sketch my surroundings. Ugh! My fountain pen almost immediately ran dry… what the heck? Had I forgotten to refill? (Yes.) I finished the sketch with a different pen, one I happened to have in my pocket. The open ground and fields are alive with color; the hills, cliffs, and peaks bounce brilliant light over the surrounding landscape, clouds create deep dancing shadows across the forested piedmont, and the sky alternates between an intense blue and a creamy summer haze. 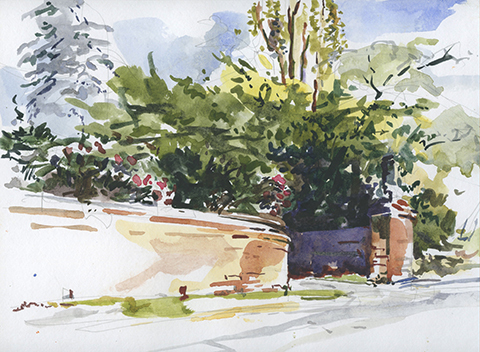 Those of us who love to sketch outside might easily be forgiven if we responded with an ever more raucous assortment of paints at our disposal. You have to know that we are just SO visually excited. To be sure, like any other season … the weather can still cause a problem in our attempt to get out there to sketch. For me, it is the typically intense heat and humidity of our Southern summers that will sometimes hold me at bay. And in the middle of the day, it is my abundance of caution that fuels an attempt to avoid the aggressive predation of UV light … especially with my once red haired/now just fair skinned self. Thankfully, I’ve worked around all these the past few weeks. 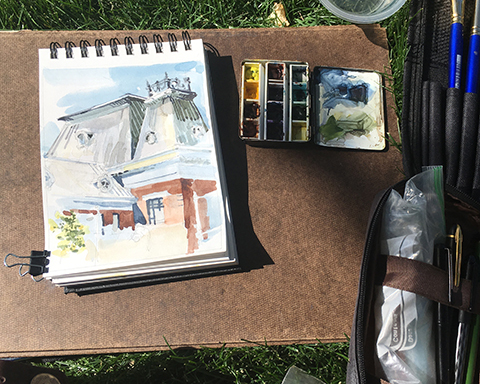 I have been working with adult students who are interested in exploring the practice of urban sketching so we have been seeking out all kinds of sites in and around town. Above is a sketch I made two Saturdays ago when we had gathered on a large plot of land divided into three cemeteries. All three where all founded in the mid 1800 and have a wide range of vistas and types of cemetery architecture to sketch. 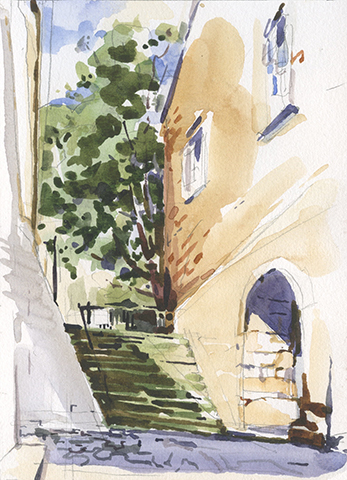 When everyone had settled into their locations, I began this 5×11 piece; using a view up the slope and through an old stone gate that leads to a narrow lane. I started with an extremely quick pencil sketch and quite soon began working with several pens to apply both permanent and soluble inks. As I neared the mid point of the sketch, a point that I most usually take out a brush and water to apply a few washes … I stopped. Completely. Instead of that usually successful and satisfying strategy, I reached for my Caran de’ Ache watercolor leads and applied a mix of dry color; most of it beyond the wall. I even pulled back from wetting these rich pigments with a brush to unlock their waiting clear color washes. Rather, I left the soluble pigments dry; blending them a bit with a paper tortillon. Then, as I moved to finish the sketch, I did lay in some more intense solid blacks with a brush pen and even used a few drops of water to sneak in touches of a soft grey wash. This wasn’t the first sketch of the summer that I approached this way either. 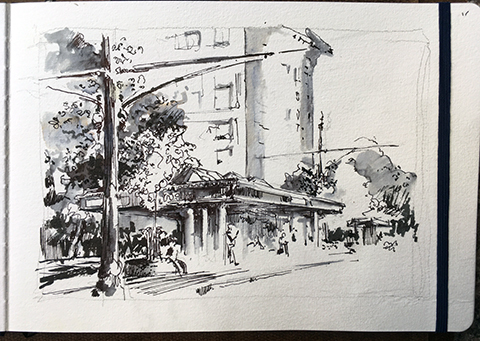 Just a few weeks ago, I found myself flying through a sketch of an architecturally complex pedestrian underpass with multiple pens, inks, and a water-brush. At the time, I did intend to add a few hints of dry local color to that sketch but I got distracted from doing so while I was still on location. To be sure, the idea of supplementing the inks with some quiet color is still pretty tempting; I could still persuade myself to do that. But I frankly like this sketch with all of it’s scruffy and unfinished qualities … just as it is! 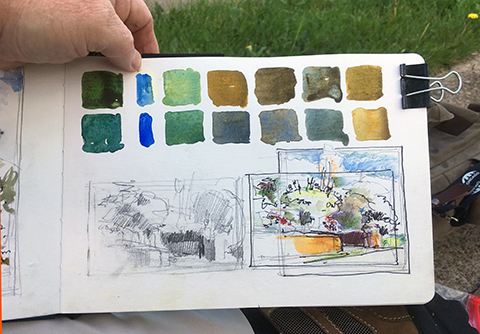 For the time of year that almost always calls for so many of us to take out the watercolors for sketching the season’s light and color … it seems that I have been drawn to at least pepper my more colorful sketching this summer with a few starker and darker pieces. 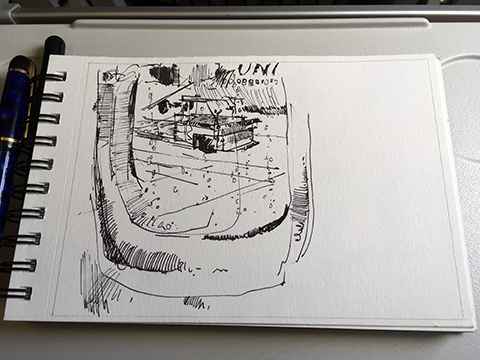 It doesn’t make sketching any easier but it has been rewarding … and quite fun.